It was a good week for running, thankfully. 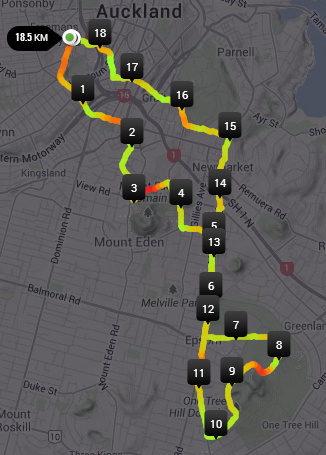 You may recall the earlier two runs, one with Deane (very slowly) around Cornwall Park, the other along a new (to me) path running parallel to the northern motorway, which was surprisingly rather beautiful. I'll run it again this week and snap some pics to show you. On Saturday I headed to Cornwall Park again for the ParkRun. I didn't talk to anyone again, nor did I go for coffee afterwards, but I did run a good time. My app says 26:02, but my official time was 25:59. I guess it all depends on when you hit the stop button ;) I was lucky to get a rain-free run, although the ground was a little damp. Not quite so lucky later in the day when I headed in to town, but I had my umbrella so all was well. I headed in to Bivouac Outdoor to purchase a Camelbak hydration pack. I got the most basic pack, which is actually designed for cycling or walking, but I had read plenty of reviews of people who use it for running and have no problems with it. It was only $70 so I figured if it didn't work out I could use it until I could afford an upgrade. For dinner that evening we had roast chicken with carrots, roasted broccoli (my current favourite way to eat broccoli) and roasted baby cabbage. Deane is very anti-carbs at the moment so carrots is about as starchy as it gets. No complaints here, I was trying to avoid a repeat of last weekend's horrible run! Sunday morning I got up and had PB&J & Apple Oatmeal for breakfast (soooooo goooooood!!) then made some buttermilk scones while I waited for that to settle. (I've used up most of the leftover whey from my first attempt at cheese curd by making waffles and scones. One more batch of waffles should just about do it.) I filled my pack with 900ml water (it holds up to 1.5 litres), bled out the air so it didn't slosh, shoved a chocolate hazelnut larabar in the wee pocket and I headed out the door. I still have some GU Chomps but have discovered that they are what send me straight to the loo as soon as I walk back in the door after a long run. Clearly, they don't agree with my digestive system and seem to want to race through it as fast as possible. A shame really, because I quite like them and they're a great energy boost. I had mapped out a route on Walk Jog Run, then written out the street names on a piece of paper in case I forgot where I needed to go. I only needed to check the list a couple of times so that wasn't too bad, and if I run it again I think I'll remember where to go. I had no intentions of running fast, and was prepared to walk a few hills. I did exactly that, but only ever walked short distances, and would've done so less than half a dozen times. My average pace was 5'40" so not too bad overall. I only ate half the larabar about 6km in to the run. I found it sat quite heavy in my stomach, and I didn't think I could handle the other half. Plus I didn't feel as though I needed it. The pack sat quite comfortably, high on my back. It didn't shift around at all, so I was really happy to know I wouldn't have to upgrade any time soon! I did loosen the straps a short way in to the run to get it sitting in the right place, and after that I quickly got used to it. The wee hose was clipped onto the strap and was easy to access during my run, and the mouthpiece was a breeze to use. I was concerned that it would get in the way of my arms while running, but I tend to stick my elbows out to the side a bit so it wasn't a problem. If you're the kind of person that runs with your arms very close to your body, you'd have to figure out a different way of clipping it in. The little pocket is accessible while running without taking the pack off, but I decided to take a quick walking break to grab a snack rather than attempt it on the run, and took the pack off to get it. I couldn't remember what side it opened on anyway and didn't want to look like a spaz with my arms flailing about trying to figure it out ;) The reservoir is now residing in my freezer, which is where the sales girl at Bivouac told me to keep it between uses (empty of course) so it doesn't grow mildew or slime. Smart. I think that's pretty cool :) I look forward to checking out more suburbs in the near future. Yay - you're under 26 mins, knew you'd get there soon! That's a great 18k run, glad you're all injury free and fit for your half which is so close now!